We hope to give you some good information in the post when you shop for a Lifetime picnic table. Typically the most important features of the Lifetime picnic table are its weight, seating capacity, and portability. First of all, its weight makes it ideal for camping use and home use. The 6 ft. picnic table, which is the most common sold, weighs in at about 81 lbs. This makes the table not light, but also not heavy when compared to rubber and wood style picnic tables. The point with the weight is that the table is built very sturdily while not being immovable. The Lifetime picnic table currently comes in 3 size: the kids picnic table, the 6 ft picnic table, and the 8 ft. commercial picnic table. The kids' picnic table seats 4 children, typically aged 1-6, comfortably, while the full size picnic tables seat as many adults as the length of the table suggests; this means 6 adults for a 6 ft. table and 8 adults for the 8 ft. table. Due to the strength of design and the size of the table, these tables are ideal for both camping trips and family get together activities. The last point to be made is the portability of the Lifetime picnic table. 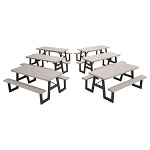 All Lifetime picnic tables are foldable, making them easily moved and setup for just about any occasion. The table is about 57 inches wide, when folded, and about 4 inches deep. Assembly of the folded mechanism is also very simple, requiring you to only have to attach the legs to the benches, and to the table top. Typically, the Lifetime picnic table is moved easily by 2 strong adults. Because the 6 ft. model picnic table is slightly lighter and foldable, it may not be idea for a campground setting without taking some effort to make sure they are safe. Most of our Campground customers will chain the table down during the camping season, and then fold up the picnic table for storage during the winter months. If your campground is not in a seasonal area, making the effort to chain the table down usually is sufficient to deter theft. Hey. I noticed your post from Bing and enjoyed it tremendously. How long have you kept the blog? Not long ago I recently developed a blog myself and its been a fascinating process. I've met some great people since then although it is frustrating at times! Anyway, thanks a ton for your post! Very nicely said.I noticed your writing from Google and liked it. Have you been writing for long? Just the other day I recently created a blog myself and its been a very fun process. I've met some great people since then although it is hard work sometimes! Once more, thanks a million for your article!